As the NGL (natural gas liquids) & LPG (liquefied petroleum gas) industry matures, many companies, from the wellhead to burner tip, are starting to implement or upgrade their price risk management programs. As such we thought it would be prudent to address the various strategies that companies can utilize to hedge their NGL & LPG (propane, butane, ethane and natural gasoline) price exposure. This article is the first in a series where we'll explain the various NGL & LPG hedging strategies available to market participants. The most common NGL & LPG hedging strategy is a strategy known as a fixed price swap. In short, a swap allows market participants to exchange a floating (index or market) price for a fixed price or vice versa. In addition to NGLs and other energy commodities, swaps are also utilized to hedge numerous other commodities as well as many other financial instruments such as interest rates and foreign exchange. Swaps are called such as the buyers and sellers of swaps are “swapping” cash flows. E&P companies often utilize swaps in order to “lock in” their revenues and/or cash flow. Many midstream companies employ swaps to lock in their profit margins. Similarly, many traders and marketers (both wholesale and retail) utilize swaps to hedge their supply costs, inventories and fixed price sales. As an example of how an E&P company can use a swap to hedge its propane production, let's assume that you're a Gulf Coast producer who needs to hedge your September propane production. For sake of simplicity, let's assume that you are looking to hedge 10,000 barrels of your forecasted, October propane production, which equates to 420,000 gallons. In order to accomplish this, you could sell a September OPIS Mont Belvieu (the industry benchmark for US Gulf Coast propane prices) propane swap to one of your counterparties. If you had sold the swap at the close of business yesterday, the price would have been approximately $0.5092/gallon. 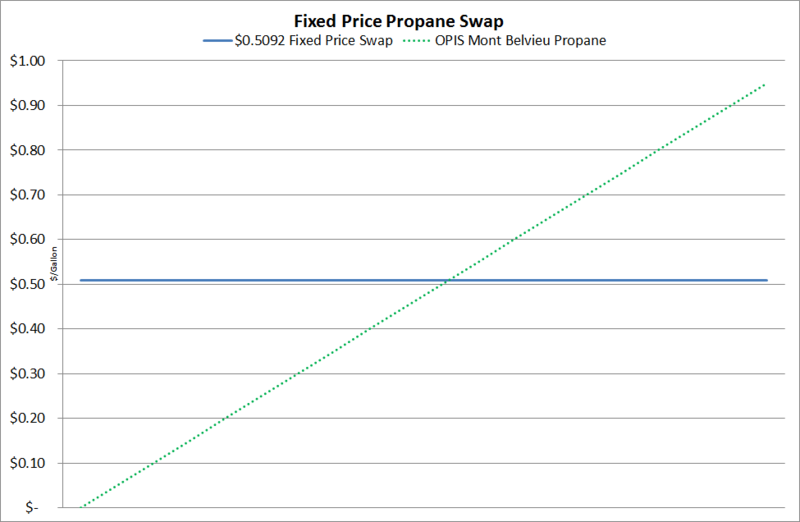 Now let's determine how hedging with the $0.5092 propane swap would impact your revenue if September OPIS Mont Belvieu propane prices average both higher and lower than $0.5092/gallon. In the scenario A, let's assume that average price for OPIS Mont Belvieu propane (as published in the OPIS LP Gas Report) for each business day in September, is $0.60/gallon. In this scenario, your swap would result in a hedging "loss" of $0.0908/gallon ($0.60-$0.5092=$0.0908) or $38,136 (420,000 gallons X $0.0908/gallon). As a result, you would owe your counterparty $38,148.60, which would offset the higher revenue associated with the sale of the 420,000 physical gallons. Excluding basis differentials and transportation fees, your net revenue (including the hedging loss of $0.0908/gallon) on the 420,000 gallons of propane would be $0.5092/gallon, exactly as anticipated when you sold the swap for $0.5092/gallon. 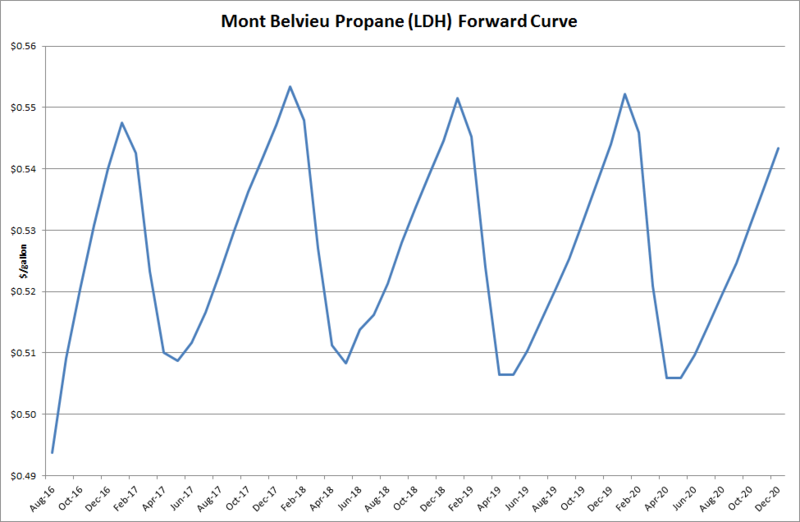 In the scenario B, let's assume that average price for OPIS Mont Belvieu propane in September is $0.40/gallon. In this scenario, your swap would produce a hedging "gain" of $0.1092/gallon ($0.5092 - $0.40 = $0.1092) or $45,864 (420,000 gallons X $0.1092/gallon. As a result, you receive $45,864 from your counterparty, which would offset the lower revenue associated with the sale of the 420,000 physical gallons. Excluding basis differentials and transportation fees, your net revenue (including the hedging gain of $0.1092/gallon) on the 420,000 gallons of propane would be $0.5092/gallon, again the same as you anticipated when you sold the swap at $0.5092/gallon. As this example indicates, selling a propane swap allows an oil and gas producer to hedge their exposure to propane prices, resulting in both revenue and cash flow certainty. If the price of propane declines relative to the price of the swap, the gain on the swap offsets the decrease in propane derived revenue at the wellhead. On the other hand, if the price of propane increases relative to the price of the swap, the loss on the swap is offset by the increase in propane related revenue at the wellhead. While this example focuses on how oil and gas producers can utilize swaps to hedge their propane price risk, the same methodology can also be used to hedge exposure to other NGLs and LPGs such as ethane, butane and natural gasoline. In addition, as previously mentioned, midstream companies, traders, marketers and end-users can also utilize propane swaps to hedge their revenues, cash flows, costs or margins. For example, a propane consumer (i.e. petrochemical plant) could hedge their exposure to propane prices by purchasing a propane swap while a propane trader or marketer could sell a propane swap to hedge their inventory cost. While this example provides a basic overview of how one can hedge propane, as well as other NGLs and LPGs with swaps, the devil is almost always in the details. If you have questions or would like to discuss how we can assist you with NGL & LPG hedging, give us a call or send us a message. Editor’s Note: The post was originally published in August 2015 and has recently been updated to better reflect current market conditions.